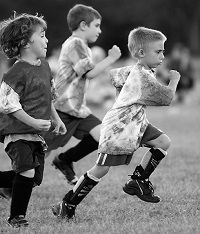 Soccer is an ideal sport for young players. The game is easy to learn, contains constant activity, and provides plenty of opportunity for players to run and learn skills. KidsPlay hosts small-sided games and scrimmages allowing for plenty of touches on the ball. Even at introductory levels, our coaches are adamant about teaching basic positions, support and teamwork. Half of each session is devoted to fun instructional training/games with the remaining half devoted to scrimmage. Two KidsPlay coaches teach a maximum of 18-22 children in each class. A KidsPlay T-Shirt is included in the program fee. Please read: Ages 4-6. .Child must be of age as of the first class. Location changed to Dodge Elementary.